«1964: Bob Devaney is not hyping his team much despite the successful 1963 campaign capped by an Orange Bowl victory. 1984: Nebraska is featured prominently in a Sports Illustrated feature on walk-ons' success. 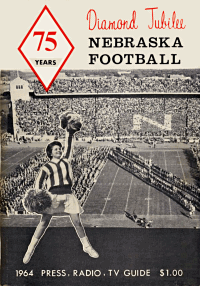 1989: The book Big Red Confidential casts an unflattering light on Nebraska football. 1994: Former Husker Scott Baldwin is released from court-ordered treatment. 1999: After a slow start, Nebraska rolls to a 42-7 win at Iowa in Kirk Ferentzs first game as the Hawkeyes' coach. No. 2 quarterback Eric Crouch had three touchdown runs, including this memorable one. 2004: In Bill Callahan's Nebraska coaching debut, the Huskers blast Division 1-AA Western Illinois, 56-17, despite Joe Daileys four interceptions. 2009: The Huskers open the season with a 49-3 romp over Howard Schnellenberger's Florida Atlantic Owls.